FORT LEWIS release - The 4th Stryker Brigade Combat Team, 2nd Infantry Division will conduct a Change of Command and Change of Responsibility ceremony Aug. 8. Col. Jon S. Lehr will relinquish command of the brigade to Col. John G. Norris in a ceremony to be held at Gray Army Airfield, beginning at 10 a.m.
Lehr took command of the brigade in February, 2005, and remained in command throughout its most recent 15-month deployment to Iraq. 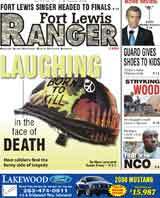 The brigade returned to Fort Lewis in June, 2008. Norris most recently commanded 4th Battalion, 23rd Infantry Regiment, of the 172nd Stryker Brigade Combat Team, at Fort Wainwright, Alaska, during that unit’s Iraq deployment. In the same ceremony, Command Sgt. Major John W. Troxell will turn over the responsibilities of brigade sergeant major to incoming Command Sgt. Major Jeffrey R. Huggins. Lakewood’s Community Connection to Fort Lewis, the 4th Stryker Brigade Combat Team, 2nd Infantry Division returned to Fort Lewis in June after a 15-month deployment to Iraq. The City will have a program on Monday, August 4th at 7pm (as part of the regular council meeting) to recognize the brigade’s deployment and its sacrifices. The brigade was an integral part of the Army’s “surge” effort which has been widely credited for quelling violence in Iraq. ➢	Introduction of the 2008 “Lakewood Idol” winner, Maureen Elias, an Army veteran and Army wife who will sing the National Anthem. ➢	A Proclamation recognizing the “2008 Army Times Soldier of the Year” winner, First Sergeant William Harlan, a Lakewood citizen and 4-2 SBCT Soldier. ➢	Unveiling of a memorial plaque prototype identifying the 54 soldiers (assigned and attached) who died while serving with the brigade in Iraq. ➢	A brief social period with refreshments. WASHINGTON (July 14, 2008) - Capt. Scott Smiley brings new meaning to the section of the Warrior Ethos that reads "I will never quit." Blinded by a suicide blast in Mosul, Iraq, in April 2005, he hasn't let his injuries stop him from remaining in the Army, pursuing a master's in business administration at Duke University in North Carolina or climbing Mount Rainier in Washington state in July 2007. The 14,410-foot climb, which only half of about 10,000 annual climbers actually complete, according to the "Seattle Post-Intelligencer," earned Smiley a nomination as "Best Outdoor Athlete," for the 2008 ESPY awards. The ESPY awards are put on annually by ESPN to recognize outstanding athletes. Nominees in other categories include golfer Tiger Woods and Brett Favre of the Green Bay Packers. This year's awards will be hosted by singer Justin Timberlake, and are scheduled to run at 9 p.m. EST, July 20, on ESPN. "I'm still surprised," said Smiley, who is also the 2007 "Army Times" Soldier of the Year. "One of my friends was watching ESPN and he said that I had been put up for the ESPY and I didn't believe him. Then another friend called me and said, 'yeah, you have.' And then my brother actually checked on the Internet and there was my name. I was contacted by ESPN the next day, letting me know that I was nominated for the ESPY and I'm still in shock. "For me, it's an amazing award just to be nominated. But I have no clue who (nominated me) or why I was nominated. I don't necessarily believe that I should be up for the ESPYs and be compared to all these other amazing athletes." Smiley actually didn't start mountain climbing until after he was injured, but said that while he was stationed at Fort Lewis, Wash., with the 25th Infantry Division, he used to stare at Mount Rainier in the distance and think about climbing it one day. So when a friend offered him the opportunity to reach the summit as part of Camp Patriot, a nonprofit that takes disabled veterans on outdoor adventures, Smiley jumped at the chance. "It's a challenging climb," he said. "I know a gentleman died a couple months ago, about 500 feet below Camp Muir. Just the wind and the snow that can begin falling, you always are having to watch the weather, and it is dangerous, but if you're an in-shape person and you can hike decently well or just walk, you can take as many days as you want or you can do it in several hours. It's a fun climb." Smiley made few, if any, concessions for his blindness, saying it didn't impact his training, which included weight-training, stair machines, running and a few practice climbs in the Colorado mountains. Making such a dangerous climb without being able to see where he was going, was a little unnerving, however. "You followed the person in front of you," he said. "You heard their footsteps and I had two hiking poles, one in each hand. That kind of gave me the ability to keep my balance. But it was difficult taking one step after the other, when you didn't know what was ahead of you, whether it was rock, how high the rock was, if it was a slippery rock, how slippery the ice or snow was, if it was going to give. So each step was very difficult in the sense that you used your whole body to balance yourself and you still had the same amount of weight on your back. Other than just great balance, it's an enjoyable climb." Reaching the summit, he added, was amazing, and one of the things that have truly made him miss his sight. "One of the things I miss most, missing my eyesight, is the beauty of looking over and seeing Mount Hood, seeing the Olympic Mountains in the distance, watching the sun rise and the sunset; that's definitely something that I miss," he said. "But being able to have it described to me and just the awesomeness of the view and the mountain, everything that you were able to see, it's absolutely gorgeous. "It was a relief that I had made it and there's a joy that I had accomplished something that not a lot of people have without sight. It's just something that I thank God for giving me the ability and my body the ability to do," Smiley said of the climb, which lasted a total of three days. Smiley is slated to teach cadets at the U.S. Military Academy at West Point, N.Y., after finishing his master's in 2009, a process eased by a program called JAWS, which reads everything on his computer screen out loud. He still uses a standard keyboard for typing. He believes he still has something to offer the military, he said, and doesn't want to squander his expensive West Point education, paid for by the U.S. government and taxpayers, while he can still be of service. "I believe that injured Soldiers should still be treated like they are Soldiers and can do the job," said Smiley. "There are millions of jobs in the military that Soldiers can still do even though they have a disability. There's thousands of jobs that Soldiers can do that don't require them to deploy. So that was a main reason, but my wife and I, we love the military, we love what the military's doing right now and we believe what we're doing is the right thing." "All-in-all, I don't think I'm deserving of any of these things, but I give my thanks to God that he has blessed me," he concluded. "Even though my eyesight was taken away, I think my eyes have been opened." Click here for the AP's report. Our story on the 4th Brigade's Welcome Home runs tomorrow, but for now, Stryker Brigade News has compiled a few of the daily newspapers' coverage of the event. Click here. WBZ has a report on Sgt. Curtis Mullin, a returning 4th Brigade Stryker who while gone had his 1987 Jeep stripped. BAQUBAH, Iraq – As the situation in Diyala continues to improve, the mission is changing from clearing the province of al-Qaida in Iraq, to ensuring it remains secure and free of criminal elements. The improved security has allowed the Iraqi police to focus on other issues. One of the larger issues the force is addressing is the training of newly hired policemen that have not received the schooling required by the Ministry of Interior. The solution to this training issue is a temporary academy that recently opened on Forward Operating Base Grizzly, near Ashraf, Iraq. Lt. Col. Kenneth E. Evans. BAQOUBA, Iraq – As the fifth year anniversary of the war in Iraq approaches, one of the big questions often asked is “Are Iraqi security forces capable of providing for Iraq’s security?” Soldiers of the 4th Stryker Brigade Combat Team, 2nd Infantry Division from Fort Lewis, Wash., are currently working closely with their ISF counterparts in Diyala province to ensure they are. One of the ways the Stryker troops work to ensure the ISF is self-sufficient is training Iraqi soldiers and policemen on basic skills during a 10-day, “basic-warrior-skills” course. When students (or jundhis as they are called in Arabic) first enter the coalition academy located on Forward Operating Base Gabe, near Baqouba, Iraq, they are given roster numbers and assigned bunks to sleep on. They are then taught classes on warrior ethos, leadership duties and basic responsibilities. Classes continue with proper ways to hold weapons and how to obtain a proper sight picture when firing. As the course continues, classes become less frequent, and the jundhis conduct practical exercises that train them on different tasks they will need to conduct counterinsurgency operations in Diyala. These exercises include reacting to indirect fire, squad movement, detainee operations, first aid, building entry, room clearing and weapons marksmanship. Near the end of the course, all the training is put together in a final practical exercise. This final test determines if the students will graduate the program or not. The Iraqi soldiers and policemen are chosen from units in the Baqouba area who possess the leadership potential to teach what they have learned to other members of their units. “I hope I can pass what I learned here to other people in my unit and my team,” said Hassan Hameed Salwan, the coalition academy’s honor graduate. The students attending the course are typically new to the Iraqi security forces and have not received a lot of formal training prior to the course. Throughout the course, instructors are watching each jundhi carefully to ensure the tasks are completed correctly and safely. The instructors also look at each student’s leadership ability and willingness to participate in events, encouraging them along the way. The course was held at Camp Taji until the 4-2 SBCT moved to Diyala in November, and the training center was relocated to FOB Gabe. No matter where the class is held, both students and instructors get something from the class – students learn valuable skills to help them defend their country, and the instructors get the knowledge that something positive was accomplished. ommand Sgt. 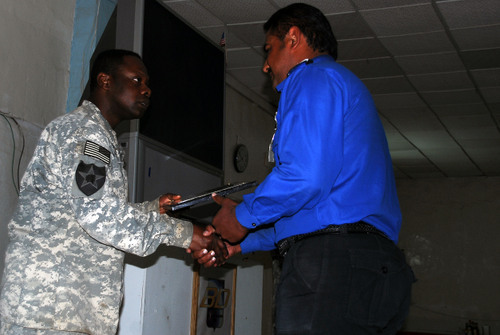 Maj. Forbes Daniels, commandant of the coalition academy, hands an award to the course's honor graduate at the graduation ceremony on Forward Operating Base Gabe, near Baqubah, Iraq, March 17. The honor graduate shows the most leadership ability and has the ability to accomplish any task given to him.